Banquet/Pre-race – Well we have been through quite a lot in the lats few days. We saw the legends Leroy Shank and Roger Williams as emcees for the start banquet. Dave drew 22 out of 24 starting mushers so we will be third from the last going out. We have been having -40 temperatures here in Fairbanks but it might be warming up. There is a lack of snow on rosebud so we will be trucking the dogs from Chena Hot springs to Mile 101 on the Steese. A first for Dave and the Quest. Adventures and fun for all. Dave lost Amazon, one of his veteran dogs to a broken leg during a training run so Dave will have 13 veterans and one rookie dog for the trip. Well, we are just getting ready for tomorrow and we will get a few hours sleep. I will try to call you from the trail with updates. 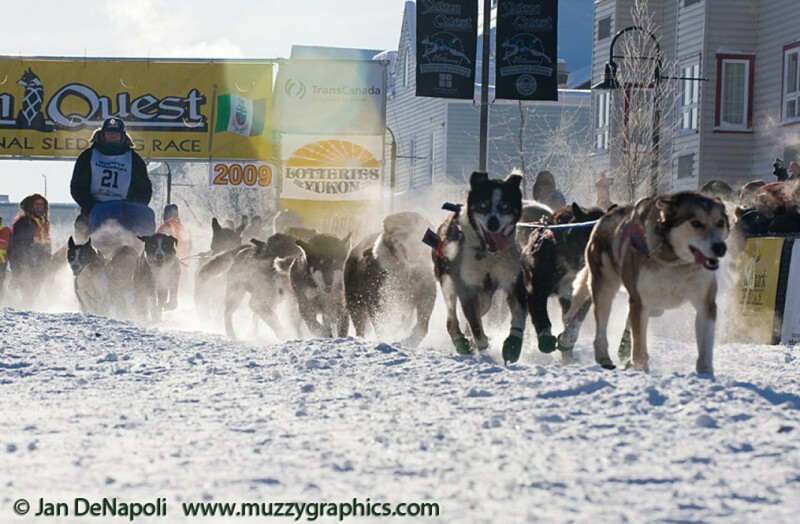 Race Start – Fairbanks, Alaska Feb. 9 Dave left Fairbanks wearing bib #22 with 14 dogs. It was extremely cold and the trail is rough. Out of Eagle Summit Dave lost the trail for a while and was “sidehilling.” He slipped from the runners and was drug down the pass. Dave said this hasn’t happened since he was a rookie. Dave and the Gang rested briefly in Central. Since it was -50oF. they headed out around 6:00 Feb 11 for Circle and a warmer weather where it was only -10oF. Rio suffered a wrist injury between Central and Circle, so Dave left him in the care of his handlers at Circle. Dave was out of Eagle after dropping 2 more dogs at 1pm on Wednesday. Dave is in 5th place arriving in Dawson City with 11 dogs. He arrived in Dawson 2/15 at 1:34 am. He’s 1.5 hours behind the 4th place musher; but, they have identical travel times between the last two checkpoints. February 18 – Monday – We are sending this from Pelly Crossing. David had to drop two dogs in Eagle, Amy and Comet. He came into Dawson with Gordon in the bag. He left Dawson 36 hours later with 10 dogs. Both Dave and the dogs were well rested and raring to go. Dave is through Scroggie Creek and into Stepping Stone. He is racing with Michelle Phillips and Brent Sass for third place. We stayed at the downtown Hotel in Dawson. They have a jacuzzi and Dave was able to relax a little and enjoy it. We had a great steak dinner at the Drunken Goat Resturant. It was fairly warm in Dawson around 0 but it is +40 degrees here in Pelly. Much too warm for the dogs. I don’t know how this will change the way Dave runs; but I know the dogs start to overheat around +15. It makes for an interesting race. I hope to give you more news from Whitehorse. Braeburn Lodge – Wed. Feb 20Dave pulled in in third place this morning followed closely buy Michelle Phillips and Brent Sass. Minutes separate them from starting for Whitehorse in the morning. Dave will be first out at 9:15 AM this morning. It is now 3:50 AM Yukon Time. Dave expects to take 12 hours to cover the 100 miles to Whitehorse. That should put him in at 9:15 PM today. It is warm I read +40 again on the truck thermometer.Dave still has ten dogs. We have just heard where is knee deep overflow on the upcoming trail.This may slow things down a bit. I will leave here in the morning and get to the sponsors house to drop the bags and the dogs to prepare for the finish.Go Dave. WHITEHORSE! THIRD PLACE! !Wednesday Feb 20Dave Arrives 10:44 pm Ganges & Zeke leading the gang of 10 dogs placing 3rd in this year’s Quest! Dave called with a report this morning 2/21. He sounds rested and strong. He said the trail out of Braeburn was tough going so he put Warthog in lead and peddled to get them moving. About 45 minutes to an hour out he put big trashbags on his feet and prepared for the knee-deep overflow. There was a thin layer of ice on top so the dogs stayed dry but the sled broke through. It made a more difficult trail for Michelle Phillips who was travelling a half hour behind or so at that point. There was another overflow spot and then thinking that was the end of it, Dave removed the trash bags. Three hours out there was more overflow This tim on a sidehill and the dogs broke through. The sled hung up in the willows so everyone was wet. Dave put on some dry socks and Sorel boot liners and rebootied the dogs. Twenty miles before the river, Dave and the gang met some photographers on the trail. He inquired about distance and timed the dogs to see how fast they were travelling. The photographers headed back on the trail to see if they could get photos of Michelle Phillips who Dave though was not far behind. An hour and a half later, the photographers passed Dave and explained that they had stood waiting for Michelle for over an hour but never saw her. Dave knew without any mistakes he would be 3rd into Whitehorse this year. About 5 miles out of Whitehorse, Dave stopped and dressed in his dry winter jumpsuit, Northern Exposure boots, and stowed all the wet gear. He arrived in Whitehorse in style as if they never saw any water. of Kuparuk, all the dogs had a turn being lead.Dave said it was a pleasure and very stress-free travelling most of the race with Michelle Phillips. They parted ways at Pelly Crossing where Dave stayed to rest dogs and Michelle moved on. We are back in Fairbanks at Lee’s place on the hill. We had a great time at the finish banquet and spending time with the Kitchen family. At the banquet Dave got up and gave a speech thanking all his helpers and sponsors. Bill Cotter lamented the trail. Dave spent time takling to lots of pretty young reporters from various media. He received a really nice carved wood trophy for third place.Whitehorse has a festival called Rendevoux and our Whitehorse sponsor family raced Dave’s dropped dogs in their sled dog and skijouring races while Dave attended meetings for the finishers club and mushers. It was a very busy but enjoyable time.